Yesterday was the day that the world finally got its first real look at Star Wars: The Force Awakens, and so in a way it's appropriate that it was also the day that Gratuitous Space Battles 2 left beta and went into full release. "Yup, it’s true, the much-awaited sequel to the 200,000+ selling indie strategy game Gratuitous Space Battles, is finally on sale," developer Cliff Harris wrote on his blog. "This has taken us twenty months to make, involved a complete redesign and re-engineering of the graphics engine, numerous changes, improvements and fixes, not least the fact that the game now lets you design the look of the ships from scratch AND has Steam workshop support, achievements, trading cards and so on." Despite the many improvements over the original, Harris emphasized that GSB2 is "actually not *that* demanding" in hardware terms, and going by the system requirements posted on Steam he's not kidding: The minimum requirement is a 2GHz CPU, 4GB RAM, and "pretty much any [video] card" that has at least 512MB and supports DirectX 9.0c. There's also a launch trailer, which isn't necessarily the best launch trailer ever (even Harris described it as "cheesy"), but you get the point: huge fleets, huge battles, huge explosions. 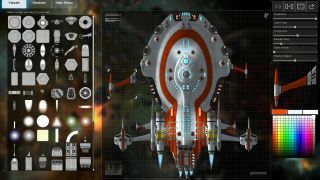 Gratuitous Space Battles 2 is available now on Steam, GOG, the Humble Store, or directly from GratuitousSpaceBattles2.com. We'll have a review soon.